A 45-year-old woman is very concerned about an eruption on her face. She has developed lesions on the cheeks and forehead over the last few months. They are not associated with itching. The eruptions are worsened with by prologed exposure to sun, excessive stress and hot drinks. She denies any history of alcoholism. Physical examination reveals a papular eruptions with assocaited erythema, telangiectasia and pustules. There are no lesions in any other areas except on her face. 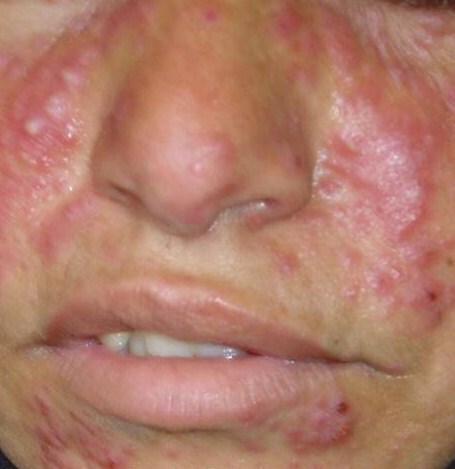 Topical corticosteroids must be avoided on the face.16 The use of fluorinated topical steroids on the face frequently produces a rosacea-like syndrome, and even low-potency, nonfluorinated steroids may worsen pre-existing rosacea and delay the resolution of steroid-induced flare-ups by months. “The goals of pharmacotherapy are to reduce morbidity and prevent complications. A topical form of the alpha-2 agonist brimonidine was approved by the FDA in August 2013 for treatment of erythema associated with rosacea. Approval was based on data collected from more than 550 patients enrolled in two phase 3 clinical studies of one-month duration. The results from both studies showed that adults who used brimonidine topical gel demonstrated significantly greater improvement in the facial redness of rosacea than those who used vehicle gel alone. In addition, a long-term study in 276 subjects who used brimonidine topical gel for up to 12-months was also conducted. In addition to the agents listed below, anecdotal evidence indicates effective treatment of rosacea with medications that reduce flushing, including beta-blockers, clonidine, naloxone, ondansetron, and selective serotonin reuptake inhibitors. Oral contraceptive therapy has been helpful in patients who provide historical information of worsening rosacea with their hormonal cycle.